Turner Falls Park, the oldest park in Oklahoma, has received national publicity and has served as a classroom for the naturalist with its distinction as one of three geological windows into our past. The other two sites include the Grand Canyon and the Black Hills of South Dakota. 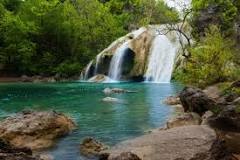 Many springs from the world famous Arbuckle Mountains form Honey Creek, which cascades down a seventy-seven (77) foot fall to a natural swimming pool, making the majestic Turner Falls the largest waterfall in Oklahoma. The park is accented with beautiful picnic areas, nature trails, caves, geological wonders, and two natural swimming pools quite unique in nature.